Did you know that Hula dancing is often regarded as a type of prayer? Perhaps a look at the history of Tahitian and Hula Dance will give you a greater appreciation and understanding for these dances that are often imitated but never actually duplicated without lesson and skillful practice. Hula dates back to the periods of Hawaiian history when strict memorization was passed down through chants instead of written documentation. These chants contained the stories of Hawaiian people and their creation and were meticulously passed down from generation to generation for preservation. In support of these stories, the hula dance was developed. Today, there are many different variations of the original hula dance but all have the roots grounded to some extent or another in the original hula dance created centuries ago. In Hawaiian it has been and continues to be a tradition to enjoy hula dancing as part of a show. Hula dance is also still regarded with much reverence for certain events. Both men and women perform hula dancing although it has been made most famous by women who were wearing grass skirts and coconut bras. This style of dress has not only been alluring but gives an excellent visual presentation of the skill that is acquired by professional hula dancers. This is a beautiful presentation, to say the least and gives many people a feeling of the warmth and hospitality that Hawaiians want people to experience whenever they visit the islands. The songs or chants that are used to accompany hula dancing are known as a mele. The mele is made more dramatic by hula dancing and two acts combined are a most enjoyable experience for those who are fortunate enough to enjoy hula dance and a mele in person. 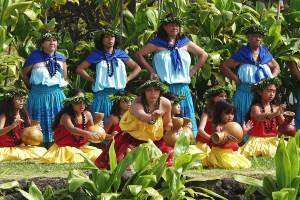 You may be wondering what the difference is between Tahitian and Hula dancing. If so, you should know that there is little difference beyond the pace that the dances are set at. For some of the Tahitian dances, there is a much faster pace that is sometimes referred to as “hip shaking” while Hula dances may go similarly as fast but are considered far more graceful and includes the hands more in the storytelling aspect of the dance. Tahitian dance sources its beginning back to the ote, which was originally a pre-European dance that was done by men only. Today, the ote’a ‘amui is the dance which can be done by both men and women. The naming conventions are not the only differences between Tahitian and Hula dances. Tahitian dances are designed to be demonstrations of life occupations from day to day versus a story of the history of how the civilization came to be. So whether your preference is for Tahitian or Hula or you enjoy both, one thing is certain: these dances are designed to share something with you that the people of these countries appreciate, enjoy and want you to know. That alone should give you a good feeling every time you get a chance to watch a performance.